﻿ Chicago Hispanic Newspaper, Lawndale News, Hispanic Bilingual Newspapers, Su Noticiero Bilingue » Whatever Happened to the National Debt? April 23, 2019 9:47 am You are here:Home Commentary Whatever Happened to the National Debt? Posted by Editor on February 9, 2017 in Commentary | Comments Off on Whatever Happened to the National Debt? The Democrats talk about the environment and global warming. The Republicans talk about jobs, protecting the United States from terrorism, and rebuilding the military. In all this talk about how to make things right, there is one missing central issue. And if neither party can guess what it is, I will give them a hint and a half; the national debt. The national debt is now almost $20 trillion and counting. Of this number, the People’s Republic of China owns $1.24 trillion of this debt. These are very, VERY sobering numbers, and the big question is how to try and defuse this ticking time bomb? If current U.S. President Donald Trump is really serious about making America “great again” and stopping the vast Chinese imports to the United States, he of all people should be addressing the national debt and China’s holding of a good part of that debt. I hear nothing about it. President Trump is talking about building new infrastructure, trying to help those regions that are in bad shape and that were missed by what Democrats call the “general prosperity,” and build up our military with more weapons all across the board. This takes enormous amounts of money……………………money we simply do not have. Former U.S. President Barack Obama helped build many things in America, but that put us more heavily in debt and he borrowed too much from China to achieve this. This strategy has to change. 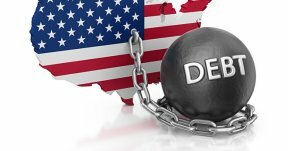 We must start NOW to try and double down on the national debt before the whole national economy implodes and takes the United States with it. For it certainly will……………and a whole lot of countries (including China) with it. What President Trump should do is try to encourage corporations to not only stay but give them very, very sweet incentives to stay—tax breaks, preferential treatment to those companies who hire as many American workers as possible, help for companies (large or small) in marketing their products, and major help in setting up, starting operations, and going to areas that are impoverished and desperately need jobs. Companies locating to such devastated places will be able to not only provide jobs but also help in good part to rebuild the crumbling infrastructure of the areas they will serve. This will free up cash for the state and federal governments to be able to spend elsewhere. Military spending can and should be frozen for a couple of years until the national debt starts to go down in real terms. I agree with the Trump administration slashing regulations. We have too many as is. But trying to slap on tariffs on goods and trying to get friends and allies to “pay more” for hosting U.S. military on their soil will truthfully not really work. We should work more closely with our friends and allies helping out the U.S. economy in having their companies invest directly and indirectly in America. Of course, I hear nothing even remotely like this happening. In fact, I see no real movement from this current administration trying to soundly change to this direction to make America great again. There is, however, something ominous about what is happening. With Trump threatening to slap a 20 percent tariff on all Mexican imports to pay for a wall on the U.S.-Mexico border, he will in fact make Americans pay for the wall as well as Mexico, and then prices for parts for many things manufactured in Mexico will cause American-made products to go up drastically too since such parts are integral for many products made in the U.S.A. (including cars). This will in turn force up the national debt. I do not like the direction the United States is heading.